This example shows how to Create Login Page Form In Asp.Net Using C# And VB.NET. To create Login Page Example, i have added a new form and placed 2 textbox and one button on it. RequiredFieldValidators are associated to respective textboxes to ensure they are not blank. TextMode property of password textbox is set so that it displays * instead of letters. 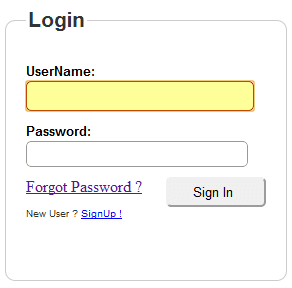 We can also Login Control with membership provider database to create login page. 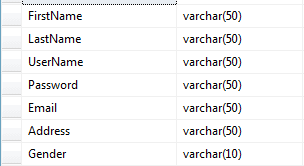 I have used a table called users to check username and password, schema is shown below. You can use User Registration Form In Sign Up hyperlink and Forgot Password Page to retrieve password by email. <asp:Button ID="btnLogIn" runat="server" Text="Sign In"
Write following code in Click Event of Log In Button. Dim strSelect As String = "SELECT COUNT(*) FROM Users WHERE UserName = @Username AND Password = @Password"
lblMsg.Text = "Incorrect Username or Password"
We can further use Forms Authentication to anonymous access to site. Please add the download file.